Our company is a China office supply wholesaler. We can provide kinds of office supplies, our office files are of good quality and reasonable prices. Here is our suspension file. If you click the icons below this picture, you will turn to other similar products pages. They are for different office uses. Welcome to choose upon your needs. 1. Material: Imported 190g white cardboard. 2. This is a neatly designed suspension file. 3. Colors: Orange, yellow, blue, green and red etc. 4. The bottom of the suspension A4 file is strengthened. 5. Classification tag cards are available. This kind of office filing products are widely used to keep files and archives etc. 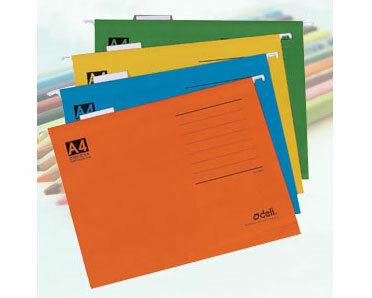 Deli group, a leading stationery supplier, can provide a wide range of office supplies. Welcome to choose. » PVC Box File 1. Rubber coating PVC material: water-proof and damp-proof.